It looks like the numbers are favoring Scott Walker as Wisconsinites go to the polls this morning for the recall election. This is going to be an example of how effective millions of dollars of out-of-state money from the likes of the Koch brothers can be against locally raised funds. Perhaps we are losing what has historically been a liberal state to unbelievable right wing lies. I hope not. 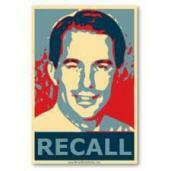 It would be a revival of pure democracy if Walker lost. Keep your fingers crossed.